There’s an old joke . . .
A comma can save a person’s life. Just as a small punctuation mark can change the meaning of a sentence, a simple gesture of goodwill can bring a rhythm and order to life. For some people, performing an act of goodwill is instinctive. Take my friend Kendra. Kind and compassionate, Kendra recently gave me flowers to cheer me up when I was feeling down. I came home to find a fragrant hyacinth plant on my front porch with a thoughtful, hand-written note attached. Hyacinth happens to be one of my favorites, but the type of flower didn’t matter. Kendra could have brought me a sack of flour and I would have been touched. It was the idea that she was thinking of me that I found meaningful. When my emotions were off kilter, Kendra helped me find the balance. For people like Kendra, doing good deeds comes as naturally as eating, sleeping, and reading the tabloid headlines in the grocery checkout line do for the rest of us. Good-willed individuals spend time helping people who are needy— the single parent who lost her job, the homeless man who is hungry, the child who needs a new pair of shoes. The rest of us spend our free time complaining—about the lady on the train talking loudly on her cellphone, the guy driving slow in the fast lane, or our kid who leaves a tissue in his jacket pocket and puts it through the washing machine. Many of us have good intentions but get so caught up with life that we are too busy to take care of our own needs, let alone the needs of others. Doing a good deed may require thought and effort but it doesn’t have to be a tremendous undertaking. Kendra, for example, always keeps a few extra quarters in her car so she can feed other people’s meters. That makes her the Good Meter Fairy in my book. But paying it forward doesn’t have to set you back even a quarter. You can give of yourself, literally, by donating blood. 100% goes straight to those in need, unlike monetary donations that are sometimes put toward things like administrative costs, publicity, and 120-foot yachts. An added benefit to giving blood is its tangible rewards. You can get coupons for free stuff and all-you-can-eat muffins and juice in the recovery area. Doing a good deed can be as simple as letting someone go ahead of you in line. Once, while buying fruit at the grocery store, I let an elderly woman who was struggling to carry a basket of groceries go ahead of me. She thanked me profusely, then let her husband join her in line. His shopping cart was filled to the brim with groceries and he had a coupon for every item. By the time I finally checked out, my bananas had ripened, but I still felt good. Doing good deeds can give our lives meaning and bring gratification and joy from contributing to the lives of others. 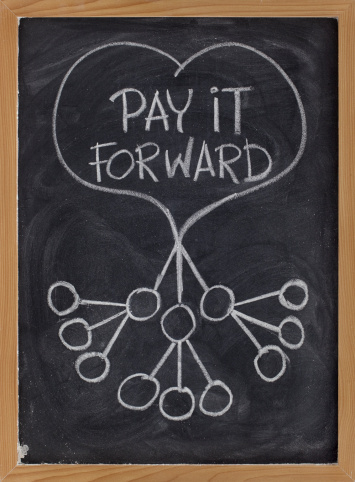 The point is you don’t have to pull out your wallet to pay it forward. Sometimes giving someone a smile—or letting them go ahead of you in line—can be priceless. What a nice way to start the week, with these kind thoughts! Thank you! Perfect. I love what I’m seeing of late. This creative conscience. Spreading the rumors about good things and good people. This is what the world needs. Maybe things will be okay. Thanks for restoring my faith in humanity this morning! Indeed, we can all be role models for one another. Love it! Well said…..now we need to just “do it”…. Exactly. Nike ought to have a special ‘pay it forward’ campaign! Your kind comment is a good start. 😉 Glad you found my post inspiring. Some very good thoughts. And a good time to read a post like this, since I’ve been stuck in the ’tissue left in the pants pocket’ mentality most of the day. Thanks. I hear you. Yesterday I discovered thumbtacks in the wash, which really put my mindset to the test. I hope you saw them before you felt them! The parking meter idea really inspired me. I especially value acts of kindness that are done in the shadows of the limelight. Right! Doing good deeds not with payback but with more good deeds! If everyone read this post and then set about to take each opportunity presented within their day-to-day to do good deeds…the world would be so much more exciting and inviting to wake up to each morning. We can all view ways every single day to light the way for others..if we only are willing to take the time to keep them our eyes open to those opportunities before us. Absolutely! And there are so many creative ways to go about it, too. It’s wonderful that you’re teaching your children those values. Next, it will be up to them. I loved this post Lisa and I completely agree with you. I try very hard to live by this mantra. Good for you LuAnn, I admire that. Nice to be able to actually see your posts Lisa. For the longest time my computer wouldn’t let me “enter” your fine world of words. It is, indeed, a good day! Now….off to do a couple of good things for Special Ones…..
Good news on both counts! It’s nice to be reminded there is good out there. These little acts of kindness can have a big impact on the recipient. Indeed, sometimes it’s the small things that mean the most. Your reminder made me feel kinder already! How sweet and humbling Kendra is. It feels fantastic to give and to receive. And yes, nicely posted. I’m smiling at you. Playing it forward could almost be considered a religious experience. Good Willing is next to God Willing, but don’t ask an agnostic. Lou, your comments are a blessing in themselves! You’re right, Lisa. It’s those moments that make us happy because we’ve done a good turn. It’s one small way to make a positive difference in life. This is really lovely, Lisa! How wonderful that you have such a terrific friend–but also that you looked beyond this sweet gesture for a way to extend it to mean more. On a side note, hyacinths are one of my very favorites, too. In fact, I wrote a short story about a terminally ill woman who comes home to find her house filled with hyacinths. Actions speak louder (and in the case of hyacinths, smell better) than words!